Get behind the wheel and head north, south, east or west–the new 2019 Jeep Compass is ready to explore in whatever direction you choose The Compass interior rethinks and redefines the cabin experience. Quality materials, painstaking craftsmanship and state-of-the-art, high-tech features blur the lines between sophistication and capability. The aerodynamic design exudes a confident stance. 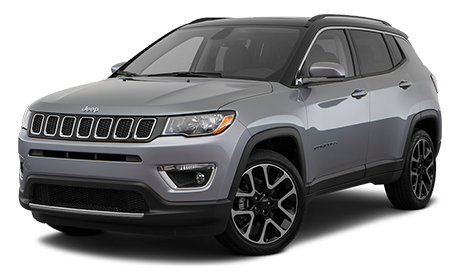 Clever visual cues like the available black roof and bright chrome molding that wraps dramatically around the entire length of the vehicle give the Jeep® Compass an upscale, sophisticated profile. All lease based on 10k miles/year. Tax title, acq, sec, reg, inspection and doc fee additional, must qualify lease conquest inventive, available to current lessees of competitive non-chrysler vehicles. Extra charge may apply at lease end. Must qualify for tier 1 credit. Finance bonus required finance through chrysler capital. 0% finance in lieu of rebate. Requires trade-in of any vehicle to qualify. Subject to program change without notice. All transaction must be complete at time of sale. By submitting you agree to our terms and conditions . $299 documentation fee not included in final price. $20 per $1,000 borrowed. Security deposit not required. Residency restrictions apply. Honda conquest required owner/lessee of Honda vehicle for more than 30 days at time of purchase Stock #J18117....J19331 ,D9639 , D9200, CJ3293 @ DISCOUNT . sale ends 04-30-2019.